Cosentino recycled glass countertops may be a new product for this well-known industry leader, but the company isn't a stranger to manufacturing countertops. Cosentino S.A. is the largest natural quartz surfaces manufacturer in the world. As an industry leader in natural stone surfacing, it was a logic expansive when the company established a foothold in the North American market during 1998. The Cosentino vision of the future inspired the company to explore the eco-friendly applications of recycled glass for some stunning new countertops. Recently, LoveToKnow's editor Sally Painter had the opportunity to discuss Consentino's ECO line with Lorenzo Marquez, VP of Marketing in this exclusive LTK interview. LoveToKnow (LTK): For readers who aren't familiar with Cosentino, what kind of company is it and why branch out into recycled glass and ceramic countertops? Lorenzo Marquez (LM): Our company has more than 70 years of experience in the natural stone and surfacing materials industry. We branched out into recycled glass and ceramic countertops to satisfy the ongoing demand for environmentally-friendly products, in essence minimizing the consumption of natural resources. We have the technology to mass produce a green surface with good performance and incredible eco-chic design benefits. LTK: The ECO line of Cosentino recycled glass countertops is made from 75 percent recycled content. Can you explain what content this is and what the other 25 percent of material is? LM: The greatest recycled content of ECO is the 75 percent that includes recycled glass, ceramics and mirrors from both post-consumer and post-industrial settings. The other 25 percent includes stone scraps, pigments and an environmentally-friendly resin that's based in corn oil. LTK: Can you explain what role corn plays in the production of your countertops? LM: Corn essentially plays an eco-friendly role in the production of our countertops thanks to the resin that binds our product together, and is actually made in part from corn oil. LTK: What types of porcelain are used in the manufacturing of the countertops? Can you explain the post-consumer aspects and advantages of why this material is used in the production of the countertops? For example does it strengthen the countertop or make it easier to mold into slabs? LM: We use recycled porcelain sinks, tiles, toilets, decorative elements, and shower basins. All of these materials are properly processed to remove any waste and are ground up to use as a material that goes into ECO by C. Ceramic, with the combination of other materials (glass, mirrors). This process allows us to have a product that offers great performance and keeps our design functional to reflect different colors and patterns. LTK: What kinds of post-consumer glass and other products are used? 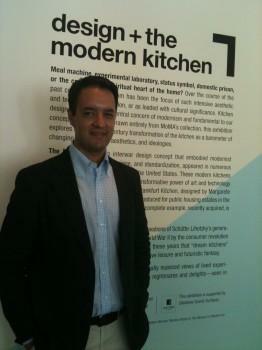 LTK: Does Cosentino use eco-friendly manufacturing processes? LM: Cosentino uses some of the most eco-friendly manufacturing processes including 99 percent recycled water, the reutilization of resources by creating decorative elements out of scrap, such as MURO backsplashes. We specialize in the production of large slabs to maximize freight. LTK: As an international corporation, where does Cosentino manufacture ECO? LM: Cosentino manufactures ECO in Almeria, Spain with locally sourced materials. LTK: How do the glass countertops compare to granite or other popular stone surfaces? Do consumers need to worry about scratches, staining, cracking or breaking? LM: When comparing glass countertops to granite or other popular stone surfaces, consumers can rest assured that our product does not promote the quarrying of natural resources, has great performance against stains, scratches and scorching, and unlike others, our non-porous surfaces need not be sealed. Another plus is that the material is very consistent and does not need to be matched when working around joints. 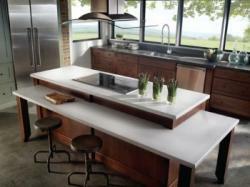 LTK: What are the advantages of an ECO countertop over other kinds of countertops? LM: The ability to provide performance and the eco-chic design with low maintenance, it does not have to be sealed, is not a concrete based product and does not jeopardize design for sustainability. LTK: What styles are available? Are they solid colors, variations? LM: We currently offer 10 designer-inspired colors, ranging from light hues to dark tones, and solids to speckled. LTK: Where can readers purchase your product? LM: Look for Cosentino products in national home improvement stores, independent kitchen and bath dealers and at e-counters. In addition to the variety of selection and impeccable production specifications, we contribute towards LEED points for building teams that use our product and are GREENGUARD, NSF and Cradle to Cradle certified. LTK would like to thank Lorenzo Marquez for taking time out of his busy schedule to talk about ECO and Cosentino's commitment to a greener world.